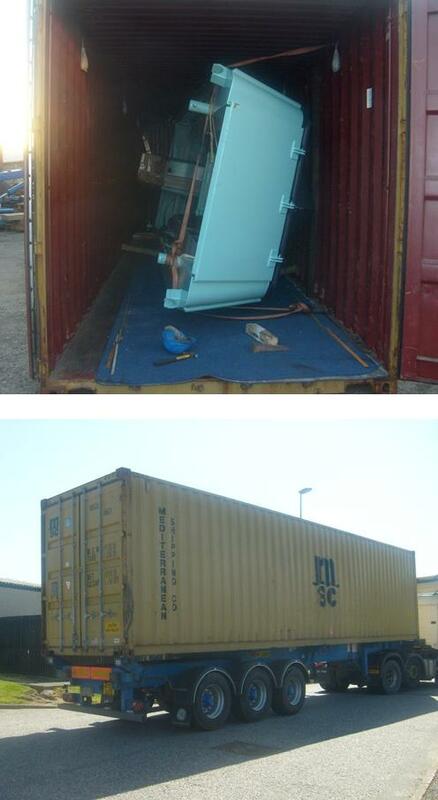 A little over a week after the commissioning service, the “Good Hope” was partially dismantled, turned on her side, and very, very carefully loaded into a container with all her attendant equipment for the long journey to Lake Malawi. She should arrive in August. We wish her, and all who use her, God speed – may she be of great service to the people of northern Malawi. During his two week visit to Macduff Shipyards to familiarise himself with the marine ambulance and be present at its sea trials, Lovemore Mkandawire was not wasting any time. He was fascinated by the tools and machines around the yard and will take back to Malawi a new skill – gas welding. Taught by the men at the yard, Lovemore succeeded in making a perfect weld at his fourth attempt. He then went on to manufacture one of the anchors for the “Good Hope” which was then galvanised and shipped out to Malawi with the boat. We are sure this anchor will, indeed, hold! On Saturday 2nd May, Rev David Randall, minister of Macduff Church, led the commissioning service for the new marine ambulance designed and built by Macduff Shipyards Ltd. As the day was cold and blustery, the first part of the service was held in the fish market next door to the shipyard, but as the crowd of around 350 moved outside for the launch, the sun came out and the wind dropped. The marine ambulance was named by Lois Watt, daughter of John Watt of Macduff Shipyards, who broke the traditional bottle across the bows and named the boat “Good Hope”, the name chosen by the Synod of Livingstonia. After the Good Hope had been lifted into Macduff harbour, there was an opportunity to try her out around the harbour.